Please leave reviews of my podcasts wherever you listen to them. I really do pay attention and take the reviews to heart. And go to the Real Estate Investing Mastery website to find show notes and previous podcasts. You can search based on subject matter or guest’s name. 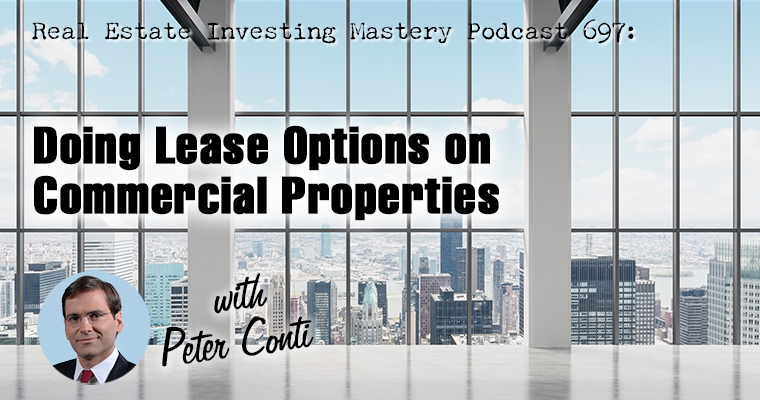 We had another podcast recently with my guest, Peter Conti, the go-to guy for lease option info. Today we’re just changing the focus from residential to commercial properties. Lease options are a great way to make money while minimizing risk. Master Lease is the industry name often associated with commercial lease options. Peter recommends face-to-face meetings with property owners. Commercial brokers can be less than helpful on lease options. Rent property from current owners and really ‘own’ it. You pay the taxes, handle maintenance, collect rents, etc. Lease for long-term and establish price for buying property at the end of the set term. Get a good real estate attorney to create lease option agreements, whether you’re doing commercial or residential lease options. The agreement needs to hold up over time… sometimes as long as 10 years. Joe McCall: Hey everybody. Welcome to The Real Estate Investing Mastery podcast. Glad you’re here. I’m excited about this podcast because we were talking to Peter Conti a week ago, as I’m recording this talking about lease options and it’s something that Peter has been in the business for a long, long time and he has seen the good, the bad, and the ugly of real estate investing. He’s seen all kinds of strategies come and go and he’s still around today to tell us what’s working and what’s not and lease options. The coolest thing about lease options that I love is they were working back 20 years ago and they’re still working today and they’ve been working a lot longer before that even. So anywhere where you can lease a property for a year and then buy it, lease it for a period of time and then buy it later on down the road. That’s a lease option. Joe McCall: They’re very simple to structure. It’s a great way to control property without owning it. It’s a great way to mitigate a lot of the risk. You don’t need much money. So in our previous episode with Peter, we talked about how to do that with houses and today’s episode we’re going to be talking about how to do that with commercial real estate, which I know is intimidating to a lot of people. It’s intimidating to me, but Peter is going to do a real good job today I know it, of simplifying it and making it less intimidating and making it more exciting. So we’re going to be talking about that with Peter First though. I want to let you guys know, go to RealEstateInvestingMastery.com to get the show notes of these episodes and if you want to hear the previous episode that we did with Peter, if you go to RealEstateInvestingMastery.com, you can find the previous episodes, but take a look if there’s a search bar at RealEstateInvestingMastery.com. Joe McCall: Go there and you can just search for the word Peter and you’ll see all the episodes that we’ve done with anybody called Peter. And I’m sure we’ve done other episodes with Peter’s. But obviously Peter Conti will be the most recent one okay. The other thing I wanted to let you know, guys is we’d appreciate the reviews. If you go to iTunes or Stitchery, you can leave a review. Let us know you liked the show and give us some feedback. I really appreciate all the comments that you guys put on there and we read them all and they’re very thoughtful and appreciative. We appreciate those reviews. Let’s see. Anything else? Hope you guys are having a good holiday and we’re coming up to Christmas here as we’re recording this new years is coming up. It’s more important now than ever at this time of the year. I really think about this a lot like planning your future planning. Okay, this is what I’m going to be doing, but it simple and keep it actionable, right? We’re in the marketing business. We’re not in the real estate business, we’re not in the commercial business, we’re not the lease option business. And it all comes down to marketing. So as you’re thinking about your 2019 goals, make sure marketing for your business is at the center of it all okay. And with that, let’s introduce Peter. Peter, how are you sir? Peter Conti: I’m doing awesome. It’s great to be with all of you on the podcast here today. Joe McCall: Glad you’re here. I enjoyed our last episode. I really did. Peter Conti: Yeah, it was a lot of fun. Joe McCall: And I read your book that you offered the FreeLeaseOptionBook.com. Is that right? That was the link we gave before. FreeLeaseOptionBook.com. I have a different version of it and I read it last week and I was like, wow, this is really, really good. So it was really nice of you to give that away for free. I hope I got the domain right. Peter Conti: Yep, that is correct. Joe McCall: Okay, good. FreeLeaseOptionBook.com. So guys go there to get the book, but Peter, you wanted to talk about something different today, something that you’ve done a lot of you got a lot of experience in this and it has to do with using master options. Peter Conti: Well, it’s basically a lease option on a commercial property. You know, a lot of people may have heard it referred to as a master lease. Is one of the names that’s out there and it’s like you said in your intro with any piece of real estate, if you can lease that arrange to lease it with the owner and then also arrange to agree on a purchase price that you can buy it at some point in the future. That works great with houses that also works with commercial. We’ll probably use like apartment buildings as an example. That might be the best way for a lot of people whoare listening to get into commercial if you haven’t done it before. And the thing I love about apartments, just to start off is, you know, it’s great to have a house and then when you get pick up one here, one there, one over there before you long. You’ve got all these different properties all over town. Peter Conti: The nice thing about apartment building is if you got a 12 unit apartment building, all of those units are all in one place and they all have the same, you know, pretty much set up and faucets and repairs and things like that, so it makes it easier to look after your real estate when it’s all in one spot. Whether you’re doing it yourself, if you’re just starting off or you have a property manager or a handy person or whatever. Which is one reason I love. I mean I like, I like all real estate, so it’s all, it’s all good. Yeah. I’d be hard pressed to say do I like houses is better or commercial? I probably would say commercial just because you know, bigger deals and stuff. But yeah, I think for any of you listening to this, especially this time a year, Joe had mentioned goals and that type of thing. Peter Conti: Wow if you haven’t gotten started with your real estate investing, set a goal to get that rocking in 2019. Even if you just set a goal, say, Hey, I’m going to get my first deal no matter what. I’m going to find a way to make it happen. Now for me, when I started off, if you didn’t hear the previous show, if you haven’t read any of my books. I was an auto mechanic. I didn’t have a lot of backing or anything. I had about $1,500 in my bank account when I started investing in real estate and I was looking for ways to get into properties without using very much money. I mean for people now you go out and look at commercial properties and some of these strong markets out there. You talk to a broker and the broker says, one of my students the day, he got this email back saying, well, I want to see proof of funds that you’ve got your 35 percent down payment and I need to talk to your financial advisor I was like find a different broker number one. Peter Conti: But there’s ways to do it and I got this from Tony Robbins years ago is if, if someone else can do something and you can find out what they did and then model that, then might take you a little longer. You might have some frustrations, you might have some obstacles, but if you’re persistent and determined, yes, you can do anything that someone else can within reason, you know you’re not going to become a professional basketball player, probably if you’re, if you’re a five foot eight like I am, but that’s my belief. And so my goal here on this podcast is to share enough with you about doing a commercial master lease that we can get that idea in your head and if it does nothing else, it gets you excited, it gets you setting some goals to get out there and get a property, whether it’s a house or a smaller apartment building or a bigger apartment building. Then I think Joe and I will have succeeded here today. Joe McCall: Good. So talk about Peter, how you got into that because you were doing houses at first I imagine. Peter Conti: Yeah, I ended up doing a little bit of everything and one of the things that made me uneasy, it’s easier these days with a lot of the software and Zillow and things like that. But when I got started, I was not as comfortable figuring out the value of a house because that was dependent upon. It’s easy now that I know you can get comps and look real closely and kind of do it like a math formula. But to me it seemed like more of an emotional thing of why someone would pay this much for a certain house and not as much for another house. The thing with commercial properties is you can figure out the value of a property by a simple formula, we where you take the income, you subtract the expenses, and then you do a simple little formula on that that converts that into a value of the property. Peter Conti: Now you can argue with someone you know what the expenses really are and that type of thing, but it’s nice to be able to compare one property to another. And so for me, I like that about commercial, that I got it. That with a commercial property, if you could increase the income, which you could do by either raising the rents or lowering the expenses, then you could increase the value of the property and not just a little bit like with a house, but a whole ton. And I’ll share a case study or two about commercial properties I did that with. But it was actually one of my mentors shared this idea with me like I’m sharing it with all of you listening here today. They got me just thinking, wow, that would be. I could do that. I could do a commercial master lease. Peter Conti: And so the idea that my mentor shared with me was the first thing you need to understand is you’re probably not going to walk out and put together a creative deal with somebody who’s, you know, listed their property with a commercial broker two weeks ago. I worked with just a handful of clients right now these days I’m not sure I want to do long-term, but I’m doing it for the next six or 12 months. And so one of my clients said, well, I’ve got these brokers I’ve been talking to can’t we just go in and offer a master lease, and I just explained to him, I said, look, trying to do that through with a broker. I’ve done it with listed properties before, but the way I did is I got everyone together and basically sat down and put the deal together and the brokers just kind of sat there and listened and collected their commission. Peter Conti: So with a lot of the creative strategies. My belief is Joe and you can, you can weigh in on this, I’m sure. I think you’re much more successful if you’re sitting down directly with the owner of the property rather than trying to work a deal through a broker. Would you agree with that? Joe McCall: Oh, for sure. Sometimes it’s not even a house. I’ll just pass on it if a realtor involved. And they’re trying to exercise too much control or. Peter Conti: Nothing against realtors that are listening. I’ve gotten, made a lot of money buying and selling through realtors. They brought me great deals. They’ve sold properties for amounts that were higher than I could keep a straight face at so that, you know, realtors are awesome, but I just want to start off by saying this is an awesome idea when you use it in the right spot. So don’t make the mistake of, of, you know, listening to the show, call up one commercial broker, they’ll tell you, oh, you’ll never ever do a deal like that and then you just put that idea away. And so just like buying houses, you’re, you’re looking for someone who’s motivated. They’re in a situation they need to solve, they’ve got an issue. They’re not just someone who’s just waiting for someone to come along and buy the property. Peter Conti: Same thing with say an apartment building. You need somebody who is in a situation that you could solve for them and because they’re in a situation and they’ve got a problem they need solved, rather than someone’s just sitting there put their property out there and hoping to make a killing on it, you’re in a much better. You have a much better chance of being able to show them how through your method of using a master lease, you’re going to be able to get them what they what they want, and in fact, I’ll share with you here on today’s show, if you stay with us, the language that you can use, that that gets them to clearly see that this is really going to be their best option even better than trying to keep selling it. So if you find the right person. Peter Conti: So, one of my students, he did a deal on an eight-unit property, was down in Florida. The property, the owner had died. It had been inherited by, I believe it was a son in the family who lived out of state. The son had never done any real estate. He didn’t want to own real estate. He didn’t know what he was doing. Out of all the units, I think maybe half of them were rented. It wasn’t run really well and so that’s as an example of a situation where you could go in and share with someone how you might be able to help them out with a master lease. So the basics of a master lease are you’re going to agree to lease the property for a set amount and we can talk a little bit later about how you might determine what that amount would be, but just like doing a lease option on a house, you’re going to agree on a rent that you pay. Peter Conti: In this case, the rent is going to be for the entire building. If it’s a 10-unit property, you’re going to pay one amount every single month to the owner of that property and you’re also going to take care of everything else. You’re going to pay all the expenses. You’re going to rent the unit, you’re going to manage it, you’re going to deal with, you know, whatever late night calls or system you have for that, you’re going to pay the taxes. The way I like to do it. I just take full charge control of that. Now, one of the first things that you’re doing by putting a deal like that together with the owner of a property is you’re taking a property, particularly one that’s in trouble or has been poorly managed or something. You’re taking that property that has been producing an average cashflow of whatever and your evening that out where they get a regular same amount check every single month. Peter Conti: And I found that something that’s generally comforting to a lot of people, I’ve seen people where, you know, their average income is maybe $2,000 a month, but when they have a bad month or a problem or you know, something comes up, a big repair, it seems like they’re not making that much, particularly if they have a couple of months, this like that in a row. Does that make sense? So what you’re going to do is you’re going to lease the property. You’re going to want to do it for a very long period of time. I think in our last show we talked about longer, longer leases. The same thing applies to commercial. Joe McCall: Yes guys, listen. Peter Conti: You don’t want to do a lease, you know that’s got a drop dead date of have to buy it in six months or a year. Joe McCall: But if you guys missed, if you want anything out of that last episode with Peter, you got to go back and listen to how he positions the sellers to accept a longer term. I mean it’s just magical. Peter Conti: Not now don’t leave us now, but so good. All right, so and then you’re going to agree also on a price that you can pay for the property. Now this is helpful. I’ve found in putting these deals together, you may have a property that if it was run correctly and it was running at a, say a five percent vacancy rate would be good in today’s market for an apartment building. Then that property might be. There’s one I was working with one of my students on in Northern California recently and that property is worth 850 if it, if it was running correctly. Now it’s not run correctly. In that case, the rents on that property are about 20 to 30 percent below market, which is awesome and you’ll recognize that. Stay with us. I’ll tell you why that’s so great if you can’t guess ahead of time and the owner of that property was considering selling that property to my client for 650,000, possibly as much as $700,000. Joe McCall: What where the rents, again, sorry? Peter Conti: The rents were. They were at about 70, 75 percent of market rentals. And the reason they were is because this was what I call a tired landlord. It owned the property for a long time. Didn’t wasn’t out of state, but didn’t live in the same town, hadn’t seen the property in four years had a property manager that ran at Purim. And if you think about it, you know when someone buys a property they’re all over it. They’re looking at it and probably doing a lot of the work themselves and doing the market research to find out what the rents are and raising them up as high as they can and you know, really running a tight ship, but after someone’s owned a property for, you know, 15, 20, 30 years, that thing, a lot of times it’s paid off, it’s free and clear. They’re making money from it without having to put any effort at all into it. Peter Conti: And you know, if they’ve. I found a lot of times people that get going with one property, they don’t stop there. They just go out and get a lot more properties and later on in life especially they’ve got their houses paid for. Their kids had been put through college. They really don’t need a whole lot of. They don’t have to go out and hustle I guess what I’m trying to say. So they fall into what I call the lazy landlord. While they’ll just let a property like that run. And that was the case with this one. You know, he could have raised the rents himself. He could have done a lot of stuff, but so here’s what happened. They were in the process of putting this deal together and he had basically a verbal agreement that he would buy it for, I think it was originally at 650,000 and he went up to 700,000 and then the seller said, well, I’m just going check with a broker to see, you know, before I sign this thing. Peter Conti: And it was a traditional deal. He was going to bring in some of his cash and some financing and just buy it outright. And so a broker said, no, this thing is worth 850. We’re going to list it for 900 and probably sell it for 850. And so that changed the seller’s perspective on, you know, gosh, I’m leaving some money on the table, maybe I shouldn’t do this deal. So when you’re talking to someone who has an apartment building like this, number one, there’s something going on. It hasn’t been well run the you know, the seller might have some medical issues or something going on where they, you know, they’re whatever it is. I do like to focus on properties that have been owned for at least 15 years or longer for this reason. If you’re looking to put together creative deals like this with, with commercial properties, there’s a better chance if someone’s owned it for 15 years, that, that they paid a much lower amount. The loan might even be paid off or a very low balance, much better chance that they’re going to be one of these lazy, tired landlord that we’re talking about. Peter Conti: So the conversation that I walked my client through was this saying, look, Mr. Seller, I understand that this property could very well be worth $800, 850 if everything was run really well. Quite frankly, as you know, you may realize it hasn’t been run that well. You know, some of these expenses are, could be managed a lot better. There’s probably room to raise their rents. So what I’d like to do is I’d like to lease the property. I’ll pay you a set amount every single month and I’ll just take care of everything. I’ll take care of the tenants and the problems and evictions. I’ll pay the real estate taxes. I’ll do everything and you’re going to get your set amount of x dollars a month no matter what. Peter Conti: In exchange for me doing that I you know, obviously you need to have a way to profit from this. What I’d like to do is I’d like to agree on a purchase price that we could have as a set price that I can basically take title buy the property from you at some point in time. And you can set that day, you know, three years out, four years out, five years out a ways down the line. The nice thing with the commercial property is if you do find a property that has been mismanaged or poorly run like this, you can do the math on it ahead of time and figure out how much you can increase the value of the property and then go talk to a lender to say, when I have this property running like a tight ship, and at that point it’s worth 850 or $900,000. What type of loan would you be okay bringing in and I’ll get into a case study that explains how you can do that and get in with very little, in some cases, no money into a deal like this. Peter Conti: So the conversation with the seller, you’re basically saying, look, we kind of know that this isn’t run as well as it could be. I’m willing to go in and put the work and effort and turn this thing around. It’s probably goingtake me, gosh, at least a couple of years, maybe even three, four, five years. You and I know Joe and a lot of you listening to this know, it’s not going to take us that long. It might take us three or four months, five months. But we would like to have time if we need it of course. And basically what you’re, the negotiation or discussion with the seller is saying, I’ll do that work, but I’m going to need. I’m going need a piece of the upside for doing that. So as I was walking my client through this, my suggestion him was if you could get this thing with a purchase price of 750 or 775 that would be awesome. Peter Conti: Even if you had a purchase price of $800,000, that’d be okay. Worst case, if you agree to a purchase price of 850,000, but you did not have to take title or close on that until eight or 10 years from now, that would still be an awesome deal. And the reason that’s an awesome deal is because when you structure these correctly, you can go in with very little to no money at all upfront going in to take over the property. They’re tired of it. They don’t want to deal with it. They, you know, turned the. I’ve taken over properties before that they didn’t give me the keys are like, look, I don’t even have the keys or whatever. I just went in and knocked on the doors and said, hey, I’m, you know, I’m with the new company running this property. Do you have a lease? If so, let me see it by the way we’re wreaking in your logs, here’s the key, blah, blah, blah. Peter Conti: So what you’re doing is you’re letting, just like we do with houses, we’re letting the fact that over time we know those rents, number one, they’re below market is ideal in a situation like this one, number two, 10 years from now, the rents are going to be a lot higher, in which case the value of the property is going to be, you know, a substantially higher with commercial property. It’s actually more than this, but just to keep it simple on this podcast, for every extra dollar that you bring in per year on a commercial property in effect makes that property worth $10 more per year. So, you know, you get something like this where the rents are 20, 30 percent below market, as long as there’s not long-term leases, which in this case they’re just month to month. You can go in and raise those rents within a couple, three, four, six months certainly, and increase the value of the property a lot. But the cool thing is that if you do it and you structure it right, your payment that you’re going tomake to them every month, where would we get that money? Let’s see. Where can we get that money to make that payment every month? Peter Conti: Yup. You got it. Take the rents because you’re running the show now, right? So you’re going to take all the rents out of that. You’re going to pay the expenses if you’re on top of it, you’re going to do a lot of the things. Like I talk in my about my Commercial Real Estate Investing For Dummies book, like getting up a smaller dumpster and having it, having it dumped more often actually ends up being a lot cheaper because other people don’t combine and dump all kinds of stuff in your dumpster. By putting in controls on the heating and air conditioning system that, that, you know, keep the tenants from playing with it. And I’ve had buildings where actually turned the heat off during the day depending on the outside temperature. So if the outside temperature is at least decent temperature, we shut the heat off during the day, which in my opinion, they really shouldn’t be in the building, should be out working during the day, but you have to, you have to adjust that it’s called a nuisance meter. Peter Conti: We would have a little thermostat that we would adjust back in a secret location the tenants couldn’t get to where if they complained, we would, you know, we certainly turn it up. We don’t want them to freeze, but yea. But you can get the cost down every, every bit of that goes to your bottom line in your cashflow that you use, number one to pay the owner out of that cashflow. And every dollar that you increase per year again increases the value of that property by $10. And that’s what I love about commercial property. So, you’re going to go in, take over the property use basically, it’s like buying a business for nothing down and then using the cashflow from the business to pay off the owner if that makes sense? Sure. Yeah. So the way you explained this to the owner, again coming back to this, circling back around, is anyone else that comes in and looks at this property, is going to find the same thing when they go through the financials and do their due diligence just like I did. They’re going to find that yes, this property could be worth $850,000, but right now it’s worth quite a bit less than that simply because it hasn’t been run as well as it could be. Peter Conti: I’m willing to go in and put the effort into doing that, getting it up to shape if you’dagree and be okay with 7:57 75 again, even if you agree at $800,000 purchase price and you had a long enough time period, maybe say five, six years before you had to close on that, then I’d be willing to have to move ahead and, you know, take on this property. Now a couple things with that. Number one, you absolutely want to make sure that you do the paperwork right. You know, if you haven’t done a deal like this before, find someone that can help you or you know, get an attorney to help you out. You want to make sure that just like doing a lease option on a house when you go to take title, you don’t want the owner of the property to say, Hey, I didn’t realize you would make it worth this much. I don’t want to sell you the property now. How do you think I know that after having done so? Joe McCall: What do you do? You have, what are some of the things you do to prevent that from happening? Peter Conti: We do a number of things. Number one, we will record the actual master lease agreement that we use on the property. Some people will say, well, shouldn’t you do a memorandum or you don’t want to let people know what your price is on the property. That doesn’t make any sense to me because if you’re buying a property these days anywhere, you can look online and find out what someone paid for it, you know, and that doesn’t affect. Maybe it affects the negotiation and a little bit if they paid a lot less two months ago, but for the most part that doesn’t really affect anything and one of the legal precedents that we want to have in place is if someone is claiming that that there’s. Peter Conti: There’s no valid agreement and you really didn’t have the right to buy it. We want to be able to point back to this agreement that’s been on the public record for the past three years to say, well, what about this agreement that was recorded against the property three years ago and this documentation that shows that we’ve made you payments under that agreement every single month on time for the past 36 months. That’s not valid. If it. Why did you accept all those payments from us, you know, is one step. And then there’s some other things you can do. We actually record a special type of a mortgage against the property so that they can’t work around you. And the reason that we developed something that it actually is a mortgage, but we had to make it where it would work to secure your interest in a master lease rather than securing interest in a loan, which is where you typically see mortgages. Peter Conti: And the reason a mortgage works is because the title companies, they know what a mortgage is and they know when it says, you know, here’s an amount that that has to be paid off for this piece of paperwork to go away from the chain of title on the property. Contact us at this phone number. You know, you hear about it when someone’s trying to do something funny like sell the property to someone else. So what you’re basically saying the seller is, look, anyone else that comes in and looks at this thing they’re not going to be willing to pay 850 either. Here’s a way that you can get this done, the deal done, get it solved, be done and over with this and move on and you’re still going to come out great. You’re going to get your 775 for it. Which, which in our negotiations were going to explain how, you know, if it was listed for 850 or nine, someone’s going to offer less than that and closing costs and fees and realtor costs and all that type of stuff. They’re going toend up getting less than that anyway, same way she would do it on a house if you’re negotiating, right? Peter Conti: So let me just tell, I’ll tell a quick story about one deal that I put together a similar to this. Corinne was 88 years old and she had a property located in Denver. It was a 24-unit apartment building. Nice property real solidly well built had these cement floors, if you looked from the underside, looked like, like the underside, but bridge like these cement kind ofbeing things going across their real solid, you could probably bounce a basketball on the floor above and you wouldn’t even hear it, which means I think some of my tenants did there. But so she had owned the property, was free and clear, had figured this thing would take care of her in her old age. Peter Conti: She was 88 years old, had Alzheimer’s disease at this point in time. I was actually talking with her daughter and her daughter’s husband about the property and it wasn’t. It just wasn’t doing it because of the reasons I talked about. She was in California. The property was in Colorado, hadn’t been run well. She’d gone through couple, I don’t know, two or three different property management companies that were really sticking it to her in fees. When I went by and looked at the property for the first time, I think there were three units that were ready to rent. I mean painted and carpets done and cleaned and everything. And there wasn’t even a for rent sign out front. So for those of us in real estate, we know. I mean the very first thing I do on any properties, make sure that front signs out front, even when the person’s still in there and we got to kick them out. Peter Conti: So, you know, I looked at the financials and the problem was she needed $3,000 a month to put her in a care home. And the property, that point was generating about $2,100 a month on average over the previous two years. But when I looked carefully at the numbers, I could see where a lot of that was due to things like, you know, having apartments that you could rent but you don’t bother advertising them or charging too much in property management fees and other costs and things that we could cut down. So I saw looking at the financials that I was pretty sure I would be able to generate that $3,000 a month from the steel. Peter Conti: The other thing, I’ll just mention it quickly here, the nice thing just like we do with lease options on houses, is with a commercial property. If you structure it correctly, you’re going in, you’re not putting any money into the deal. You’re taking over the property. If you do your paperwork right, what’s, what’s the downside? Well, when you have a least, there’s always language in there that says, if you don’t pay the lease, here’s what happens in that language basically says that the owner has to give you a notice. And, and you’ve got the right to cure and that type of thing, but that the owner takes over the property if you stop making the payments on it. So I looked at this deal and I remember my wife was a little concerned about it and I said, look honey, this deal, if it doesn’t turn out and it’s not working out, well all we need to do to stop making the payments on it and then the owner takes the property back over. Peter Conti: It’s basically like you can give it, give it back to them. So how awesome is that to get into real estate if you haven’t done deals before, to get in and be able to test like test drive the car and take it home and be able to bring it back after six months for a year. Joe McCall: Which tells you about the power of options. Peter Conti: Yeah. Yeah. Now, this property had been referred to me by a real estate broker and one of the things I work with my clients to do is, is create relationships with real estate brokers but, but don’t expect them to have three deals sitting on their desk that you’re going to be able to do, you know, creative financing on this particular broker. His name was Tim. I’d gone out to lunch with him a couple times. I got to know him. We had kids that were the same age and I basically said, hey, I’m looking for deals like this. If someone’s willing to carry the financing or something weird or whatever, if you meet someone you can’t do a listing, let me know about it. And so he attract down the owners in California and gotten hold of them and they weren’t willing to sell the property because at this time it was worth $450,000 were worth more than that now in today’s market. But they didn’t want to sell it because if they sold it because of it had been fully depreciated and that type of stuff, tax reasons, they would have had to pay a lot of capital gains on it. And they didn’t want to do that. He said, well, I can’t put together a deal on this. Why don’t you see what you can do? So I got ahold of them, found out what’s going on and talk to him a little bit. Peter Conti: And then I invited the let’s see, would have been the owner’s son in law. I invited him to come out and travel to Colorado. Now this applies to any real estate deal that you’re doing. If you can get an out of state owner to fly into town to meet with you, to talk about putting a deal together, I think that raises your odds of doing a deal. I don’t know, what do you think, Joe? Ten Times as much. Joe McCall: It’s not very often heard of. Peter Conti: You know, they’re not meeting with anyone else. As far as I was aware of, basically came into town to put the deal together. And the other thing that worked out really, and this was just blind luck, was I met them out at the property and I guess I guess there was a problem with the property and was talking about maybe coming out to check it out. And I said, well hey, let’s get together and meet out there and we can talk about how we might structure this. So we go out to the property and there’s this boiler room where you, you know, darkly lit, you go down these steps and there’s, this guy it was on a weekend, he’s wearing the blue, like a HVACworker guy uniform. Which to me that, that signals that you’re getting charged $125 an hour or whatever they charge. And the water Joe was about two feet deep on the floor. It’s like this black water on the floor. With like bubbles coming up like look like which is brew or something. And you know that, I mean it looks horrible if you haven’t been around real estate, you know, it sounds like, oh my goodness, that’s a nightmare. Why would you ever want to buy a property like that? Peter Conti: But from a negotiation standpoint, it’s one of my students, one time he would take people out back and negotiate by the stinky dumpster is the way. Joe McCall: Yeah, that’s a good idea. Peter Conti: So it was pretty good setup that way and it’s, you know, yeah, it’s a nightmare, but it’s, you know, it’s like a $10,000 nightmare. It’s not an end the world nightmare. So we went to, I think we went to a Denny’s and we sat down and put the basis because the deal together and, and actually use their attorney to draw up some of the stuff of course that my attorney take a look at it, but we put this deal together where I agreed that I would pay $3,000 a month and that I could buy the property for 450,000, which was the full price that the broker had wanted to list it for them at that point in time. Peter Conti: At the point in time when Corinne passed away, now she was 88 years old and had Alzheimer’s, so we didn’t know how long she was going to live, but she knew, we knew it wouldn’t be forever and that was one mistake I made on this deal. As a side note, there’s something I found out later called the rule of perpetuity and you, you’re not supposed to have a contract that just goes forever and this deal is actually one of the, one of the deals that, that people have tried to fight me on closing on. You’ll see why in just a moment here. So we had put it down as when Corinne dies, when she passed away, Peter my company can take title at $450,000 purchase price. Peter Conti: Now this was one of the first deals of this type that I did. So I went to a mentor of mine and said, Hey, I’ve got this deal of putting together, what do you think about this? And he said, wow, that sounds like a great deal. I said, well, how can I make it better? He said, well, you could ask the owner to carry the financing, you know, when you close on it. So I went back and said, yeah, it looks pretty good. The only thing I’d like, you know, I’d like to get is I’d like you to carry the financing when I, when I take title. And they actually agreed to that. They agreed to like 30 year owner carry financing when I bought it. Pretty good deal, right? So I went in, you know, took over the property, the rents on this we’re, we’re below market, which was awesome. They were on all on month to month, so I could’ve done it all at once, but I didn’t want to have a mutiny. Peter Conti: So what I did is I sent a letter out to eight, the first month, eight the second month and the final eight, the third month, and the letter said something to the effect of, Hey, you know, I’m sure you’ve had a great time living here enjoying the below market rents. Unfortunately, you know, death taxes and rents. It’s time for them to go up. And we offered to raise their rents, not all the way up to market level, but you know, jumped pretty good up towards market level. And then the letter said, and you know, to let you know, we appreciate you as a great resident will give your choice of one of these three things. You can have any one of your rooms painted you can have your carpets cleaned or you can have the services of our handy person for half a day. Peter Conti: Now, those are all things that you’re going to do anyways when you take over a property, right? You want to go in and get it painted and cleaned and looking nicer. So about, out of the eight each month, we had about half, you know, three or four or five. It said, forget it. I’ve been paying this low rent for years you know, you’re crazy. I’m out of here. We’re like great here. I hold the door open for you, you know, get your stuff out of the way. Make it easier for our crews to come in, paint cleaning carpets, get it which case we rented those units for full market rent and the net effect was we ended up over that first three months. We ended up raising the rents an average of $85 per unit over 24 units. Joe McCall: How much per unit? Peter Conti: $85 per unit, and I haven’t done the math on this in a while, but I think it was right about $2,000 a month increase. So the effect was financially in this may be hard to get her a podcast, so don’t try to follow along with this typically if you’re driving, but when I took over the property by doing some of the property management stuff myself in the beginning and not having to pay a property management company, basically I took over the property. The property was generating enough money to pay the expenses and create the $3,000 a month that went to Corrine. Does that make sense? Then with this increase and reducing some of the expenses and that type of thing, we were able to generate $2,000 a month in extra income, which goes into one of my favorite banks. Do you want to guess which bank it is Joe? Joe McCall: Hip pocket National Bank. Peter Conti: You got to. Of course, gets paid taxes on it before it goes in there. So the cool thing about that is if you do the math on it, again, it depends a little bit on the market that you’re in, that type of thing. But that’s in round numbers. 24,000 a year. Again, with where cap rates are right now, it’s more than that, but let’s just keep it simple and use that. Use that 10 factor. We know a dollar makes it worth $10 more. So in this case, $24,000 makes it worth $240,000 more than when we bought the property. Isn’t that cool? Peter Conti: So I could have sold the property at that point in time and just, you know, exercise my option early. It was making good, good money and he was a solid building located in adecent area, not, it wasn’t a building, but it was probably a c plus building, possibly maybe a b minus. And I just, I just kept that thing and pretty quickly turned it over to a property management company because I didn’t want to, I don’t think you make money dealing with tenants in real estate. I think you make money by using your brain and putting deals together and, and letting the value real estate go up over time. And so that’s what I did. And I, and I just had that property sitting there. Peter Conti: When Corinne passed away, they did attempt to defeat my interest in the property. They, they started posting notices and saying, we’re canceling your lease in that type of thing. I had, I had a good attorney. I made all the payments. They kept accepting my payments and cashing them while this was going on, which kind of makes it hard to say there’s an, there’s no agreement in place that they keep cashing your checks. And basically we worked it out because I stood my ground. I said, no, I’ve done everything I said I would I’m not going to, I’m not going topay you a higher price for the property, you need to sell it to me for the $450,000. And they, as you recall, they had agreed that they were going to carry the financing for 30 years, I think to get it done and to stop thinking about it and legal costs. Peter Conti: I basically said, look, if you’ll go ahead and close the deal, I’ll bringingnew financing and you don’t have to carry the financing and be done with it. So that’s what we did. I found a lender who at this point in time the building was worth seven 75, 800,000. I found a lender who was willing to come in and do a refi on the property even though I had not put a single dollar into it. And they brought in financing and basically provided the 450 to cash the owners out that the property was producing income. Was cash flow positive through all this time? I in fact got a. At one point I had a 15 year mortgage and I moved it up to a 10 year mortgage because I just wanted to get this thing paid down and let that property sit there with a property manager. Peter Conti: I would, I would maybe go by there, you know, once or twice a year or something, just to kind of look at it and say, hey, isn’t that cool I put that deal together. And I owned it a total of about 12 years. And by that point in time when I sold it, I had just about. I was getting close to paying the mortgage off on it and I actually ended up selling it on a master lease if you can. Isn’t that cool? Buy It on a master lease. Joe McCall: How much did you sell it for? Peter Conti: I sold it for, it was like one point 2 million. And what my goal was kind of. I don’t know, it might be a stupid goal. My goal was I want to make a million dollars on and nothing down deal and I hesitate to tell this. So if you’re listening to this please, you know, I know there’s like these, just like if you haven’t been around real estate or you haven’t done a deal yet for someone to go out and do a deal, nothing down, deal, make a million dollars on it. I know probably your bs detectors are going off. That’s fine if you can believe this or not, I just know that, that I wanted to do that on a deal and I thought it would be really cool. Peter Conti: So anyways, yeah, put it together where I sold her on a master lease and the guy that bought it, he was, he was making, you know, making payments to me at that point in time. And then he brought a new financing and the effect was by the point in time that he cashed me out, he had the loan had just about paid completely off, ended up making a million bucks on nothing down deal, which is pretty incredible. If you’re listening to this don’t think that you’re going to go out and you know, your very first deal, do a home run. This is a home run deal certainly, but if it’s a deal that gets you excited enough about real estate to see where just a regular auto mechanic like me and it didn’t even go to college, is able to take an idea like this, which is really what I did. I took the idea, I, yeah, I went out and started creating the connections and stuff, looking at the marketplace and talking to people and, and you know, shaking the bushes and, and I’m looking at lots of properties and making lots of offers and stuff. But if you’re out in the marketplace looking for stuff, you’re going tocome across your own home run deals and you’ll be able to be on the podcast here with Joe in six months or six years from now telling your story about an awesome deal like this that you did. Joe McCall: That reminds me when I was getting started, Peter, I remember getting discouraged about, oh man, everybody else is getting all the deals are getting discouraged. If I made an offer and I didn’t get it accepted. And I heard somebody say once there’s a million dollar deal every day, and what he was meaning by that is if you miss one or you for too late or whatever, don’t get discouraged, keep on going strong at it because there’s going to be another one right around the corner. You can only and you’ll the only find them when you make a lot of offers. Peter Conti: Well, and I think if you have the mindset of not letting someone else determine your, you know, your view on life and the way that you’re going to go about things. In our in our previous podcast, I told, I told the story about how when I was working as an auto mechanic and the owner of the coffee, the auto repair shop came over and said, Peter, that coffee’s for customers only. I made a decision there. I wasn’t going to let him or anyone else determine my financial future. I wasn’t going let them determine my life. I wanted to say, hey look, we’re here for a short period of time on this earth. I want to do some great things. I want to put my kids through college. I want to have. To me freedom is what it’s about. The ability to get up each day and decide what you’re going to go and do. That to me is worth more than any amount of money. Although money makes a lot of things easier. Peter Conti: And real estate, I just feel so blessed to have been involved in real estate and, and particularly be able to reach out on something like this podcast and give someone a shot in the arm hearing something list like this to say, wow, wouldn’t that be cool if I could, you know, go a deal, do a deal like that. And so that’s you listening to this and maybe listening to a deal with, you know, flipping a house and having to work really hard and making, you know, 20,000, $30,000. That sounds like a lot of work. Maybe this story will get you excited enough to go out and find your own path, whichever method it is. And that’s another thing about real estate. There’s so many different ways of working deals and putting stuff together. And particularly today with the technology and stuff that you can get online and find out, you know, what stuff’s worth and what people paid and who owns it and all that type of stuff. Awesome. Joe McCall: Yeah. Good. Can you, I just have some questions really quick because I know we’re coming up to an hour, but I want to. Could you review, some like finding these deals. I know you talked about beating, beating around the bushes, shaking the bushes, shaking the bushes, fruit falls out. A lot of it is just getting out on the street, knocking on doors and looking for the deals and talking to people and networking, but are there, is there any direct to seller marketing that you like to do for these commercial deals? Peter Conti: Well, I think, I think probably when it comes to marketing, you can tell me if you agree with this. I think what everyone wants is they want to buy a list of somebody off, you know, some website or get some magic system that you push a button and it’s going to, you know, find incredibly motivated people with the deals to do something like this. I’ve found marketing is in real estate. It’s just like any other business. It’s a combination of everything that you do. It’s a person you meet, you’re talking to when you hand them your card and say, you know, hey I invest in real estate. If you know anyone that has a commercial property. I was talking to one of my clients the other day and he’d been, you know, he got started and he’s just been, been working at it for about three months now. Peter Conti: But so far all he’s done is go to commercial brokers and you know that’s good I think more from a relationship standpoint from the aspects of it. Hey, if you’ve got a deal or a funky property or something that you know, doesn’t work or is, you know, half burned down or something, give me a call, but I am not going to probably buy the property that’s fully leased up turnkey deal that requires, you know, 20, 30 percent down. That’s probably not the deal for me. And of course that’s what he’s finding. So I shared a couple of ideas with him. One was to reach out to property managers and network with property managers. Pretty easy if you’re getting into commercial real estate, you’re going to need some property managers to take care of your property in the course of getting to know them or interviewing them. Peter Conti: I actually went to like property manager meetings, where I could have some face to face time with people. Hey, here’s who I am, here’s what I’m looking for. If you know of any properties that have been poorly run or maybe the owners aren’t willing to put the capital in to run the property the way you know it should be. I’m looking for a great property manager and of course I’m always looking for deals like that and I’ll make sure that you get taken care of if you refer me a deal. And you know, if you’re decent property manager, I’ll make sure you’re the property manager on that property as well. So that’s one resource. The other one I mentioned was residential real estate agents and brokers. Now why would you go to a residential agent for commercial property? Well, what I found is that people get a relationship with a residential broker sometimes where they bought their house or you know, a couple, three or four houses over the years and it’s kind of their, their real estate person, right. Peter Conti: That person might also own a small apartment building or medium sized apartment building, or maybe their parents pass away and they inherit a four unit. I did a deal one comes to mind where you know, they weren’t landlords, they didn’t know really what to do, so they reached out to the residential broker, residential broker doesn’t know commercial, isn’t going to probably take them through a whole big thing and looking at everything and saying, Hey, your property’s worth a zillion dollars, you know, list it with me type of thing. So sometimes residential brokers can be a good resource to say, Hey, my client called me the day and you basically end up getting a pocket listing because they’re not quite sure what to do with it or even how to value it, if that makes sense. You can do mailings. There’re services out there right now. One of them is called Reonomy.com that they actually show you the different properties and they have the owner contact information available. Not on all properties but a lot of properties, in which case you can reach out to them, send them a letter, that type of thing. Peter Conti: I think the challenge with some of that marketing is how do you break through, you know, with all the properties I’ve owned over the years, I’ve gotten a lot of mail of, hey, I’d like to, you know, I’d like to buy your property, call me type of thing. I put them in a file and save them of course being who I am, but how do you find a way to create a connection with those people? And so for one of my clients right now that I’m working with, I’m actually helping him put together a commercial property owners association in his area. There’s really not an apartment association or group that already fills that method. Which networking at the apartment owners association, if you’re already in a big metropolitan area that has one, is a great way to meet owners and also about you know, a thousand vendors that want to sell you stuff. Peter Conti: So I think finding ways to get people. If you think of people who are going to be around commercial properties, appraisers, people at title companies, people are going to be in the business and around properties and around property owners. Were If you can get them to know that you’re the whatever guy, you’re the commercial guy or you’re the guy that’s looking for apartment distressed apartment buildings and you’ll look at anything you’ll make offers anything. They might not like the offer, but you’ll. You’ll come and look at it. You’re a serious buyer. Then that gets you into a situation where number one, you’re getting a property that ideally isn’t out on the market where no one else knows about it. Number two, I found like we started the call off you’re talking about. If you can connect directly with the owner of the property, oftentimes I think you have a much better chance of putting a deal together. Peter Conti: And you can do that even with listed properties. I was looking at a mobile home park with one of my clients a few years back and talking to the broker and we said, well, great. We’d like to meet at the property. If the owner could be there, that’d be great. We’ll probably have some questions. And in this case, the broker drove quite a ways, I don’t know, like three or four hours away drove all the way to get there. And of course I had flown in from out of state and as well as my student had. And so, we’re there talking and starting to go through this process of, gosh, I, you know, I don’t know if we can help you or not. We’re looking at a lot of properties, that type of framing and it wasn’t very long with the brokers, like, like, well, I don’t think we’ve got a deal here. Peter Conti: You know, he didn’t, he wanted to get home before dark. So he jumped in his car and left. Well he’s getting ready to leave and we said, well, we’re just going to walk around, you know, we’re going to walk around the park. And so we took a lap around the park and give him time to get out on the road. And then we, we said to the owner, hey, is there a place we can go down and sit down? Have a cup of coffee and we sat down and I remember we had apple pie and coffee and the owner in that case was, was willing to do a deal, but the numbers just didn’t work out in that case, it wasn’t a property we ended up ended up buying. But that’s a good example. You know, sometimes people ask me, well, how do you, you know, you asked the broker, can I, can I talk to? Peter Conti: They’ll go directly to the owner and in most cases the broker is going to say no, they’re worried that you’re going to go around them, or not pay their commission that type of thing. So I just find if you can sit down with someone and create some good rapport, really enjoy getting to know them and finding out, finding out what the heck’s going on, just like we do with a house. This is, I mean this is a great little six-unit property. Why would you ever consider selling it? And you know, get them talking about the tenant that, that, you know, moved out and trash the place. And what I read, if you’re not involved in real estate and you hear just the horror stories, number one, if you get in real estate and you don’t run it like a business and do things correctly, yeah, you’re going to have problems if you, if you don’t have a system in place to, to move quickly and get people out of your properties or evict if you need to say don’t pay the rent. Peter Conti: That’s where you get these horror stories where people say that that person was in there and they lived there for two years without paying me rent. I hear stories like that. All I can think is, yeah, and you’re a lousy business owner because you didn’t step up and make it happen the way you need to. You know, if someone doesn’t pay the rent, I, I look at it as someone going into the grocery store, filling up their shopping cart full of groceries and pushing it out the door without checking out. I guess you cando that at some Amazon stores now. But um, so, but if they don’t pay, you know, you go, hey, you need to, you need to pay your rent. If not, you need to find someplace else to live. So yeah. So is that, is that helpful? Joe McCall: Yes, it is. It’s about relationships one on one and then when, when you’re getting with the seller, you know, try to find a way to get the broker to work with you, but you got to stay in control of. So Peter you wrote a book. I didn’t even talk about this at the beginning. I forgot about it. Do you still like the book? Is it okay to talk about it? Joe McCall: The Dummies book. Peter Conti: Oh yeah. Commercial Real Estate Investing for Dummies. Yeah, it’s available on Amazon or I might have a URL if someone wanted to get a free copy, I’ll, I’ll pay for the book you just cover the shipping. Joe McCall: Yeah, let’s do it. What is it? Joe McCall: PetersFreeBook.com. So there’s an s after Peter? PetersFreeBook.com. Very nice. Peter Conti: Yep. It’s a Commercial Real Estate Investing For Dummies book. It’s awesome. That was one of the funniest books I’ve ever written and the neat thing about the dummies book is they wanted us to write it where you could sit down and just in one section get like a really nice chunk of a strategy or something you could use without having to even go through the whole book. And we have a section in there on master leasing properties that goes into more detail than we had time to get into today. Joe McCall: Wow. Very cool. I’m looking at the website looks nice and the reason I asked if it’s okay if you still like it is because sometimes I know you published this a while ago. But the Dummies company, do they still let you have any control of the book after you’ve written it or do they have a pretty tight control of that or how does that work? Peter Conti: Well with a, with a mainstream publisher like that, they, it’s kind of like we have the joint copyright is the simplest way to look at it. I don’t have the right to print it and go sell them, but they do give me a discount and I’m a. I recently ordered a couple of boxes is why I’m able to offer that free book offer. But they gave me a good discount on it. And out of all the books I’ve written that one still, I don’t know if it’s the market right now, are a lot of people realizing that commercial is great place to be. It’s selling incredibly strong and I actually get a nice royalty check for me and Peter Harris, the coauthor, I did the book with a every year, which is nice income, right do work once. And the nice thing about commercial is commercial hasn’t changed even though we did write it a few years ago, the basics of finding a commercial property and going through and learning the formulas to evaluate a property and the, the ability to go in and, you know, run a tight ship. That hasn’t changed. Peter Conti: What has changed is, and this is beyond the scope of our podcast here today, but there’s lots of ways that people are coming up to basically get higher income out of the small, same amount of square foot, so with like office buildings where people are doing, used to be that, that executive suites was a way to do it. Now people are doing coworking like We Work does, where you’re providing a whole experience in a range of services and with apartment buildings, one that came out recently is in some metropolitan areas they’re offering I’ll just call it co living. I don’t know if there’s a better name for it. Maybe there is. They basically have the building built where the bedrooms are built kind of like a unit by themselves. So they’re built insulated sound wise where if you’re in there you’re kind of closed off from the rest of that unit. Peter Conti: So, they might have a unit that has a four or five or six bedrooms off of it. And then a common kind of kitchen area. They don’t have a common living area interestingly enough, it’s, it’s, you know, if you want to go hang out, it’s in someone’s room interest and then they have actually an app that you can use to match up to what other type of people that you might want to be kind of co living with and they actually offer some other services and things of, you know, we’ll get your laundry done for you or you know, whatever things to make, make it easier for someone to live there that are probably millennials, a single people type of stuff for the most case. And it’s very interesting you look at that and say, wow, that is really cool. They’re getting higher rents out of that same amount of space, which, which that’s, that’s pretty interesting. Joe McCall: Okay, interesting. Yeah. Well the book URL again is Peter’sFreeBook.com, Peter p e t e r s PetersFreebook.com. And anything that you want to give away to folks or another website you want to send them to or is that just, is that good enough for now? Peter Conti: You know, what I’ll do is I’ve been thinking of adding a training. It’s actually one I did with my, my elite clients. Now these are people that pay me 50, 100,000 dollars that want to learn how to go out and syndicate deals, go out and raise money from investors to where rather than doing creative deals like this, which you can still do those, you have the ability to go and look at lots of properties and go to brokers and say, Hey, I’ve got the cash on hand or I’ve got the investors in the funding, you know, here’s a cash you out today type of price on a property. And that’s kind of a cool way to go. It’s a little more advanced, but I think there’s, gosh, I don’t know, it was a two or three day workshop and we recorded the entire workshop and I’ve been thinking about adding that is an extra bonus to people at some point. Peter Conti: And I’m going to go ahead and add that on. I’ll try and do it before you guys hear this podcast, but in case I don’t, I’ll make sure you have access to it anyways. Even if I don’t get it on the page, you know what I’ll commit to getting on the page so it’ll say, hey, as a bonus you also get this. Now. That’s not something that probably someone who hasn’t done any commercial before is probably going to go out and become a master of that overnight, but I have my clients now go through that training because it gets them starting to think about where they’re going. They’re not just, you know. Yeah right now, if you haven’t done deals before, it might be going about going out and getting a four unit or a, you know, a 12 unit or a 20 unit to get started, get your feet wet, but really to run a six unit really isn’t any different than running a 60 unit or a hundred and 50 unit property. Peter Conti: In fact, the larger properties, it’s almost easier because they can more easily afford to take care of property manager, a crew to look over things and run it for you so you don’t have to be involved with it. What I like my clients that I’m working with now to start thinking about is how they can, number one, have a bigger mindset. Number two, start putting some little teasers out there to people that you meet. You know, what are you up to you? Well, you know, I’m, I’m basically, I’m putting together a commercial property portfolio. I’ve got this really interesting deal that, that I’m looking at. I don’t know if it’s anything or not. It might be a chance for someone to come in. I’ve got people that give me, give me money that want to get great returns on it. I don’t know if you know someone like that or not, but. And again, I don’t know if this deal is going to know. If you want, I could. Would you like me to let you know if it ever turns in anything, would you have an interest in that? And it, it’s a way to get people starting to get comfortable raising money without chasing after people is what I call it. Joe McCall: That’s good. Good. And again, PetersFreebook.com. Peter, thank you for your time. Peter Conti: Oh, you’re very welcome. And for those of you who listened to me before or read my books or maybe listened to last podcast, you that I enjoy so much being able to take someone who either hasn’t been investing in real estate before or maybe you’ve tried some things and struggled or maybe done some stuff on your own Yemen found it’s worked out as well as you want it to. Or maybe you’ve already had some great success. You just looking at some other great strategies and tools to add to your toolbox. I love being able to be here and give you a little kick in the pants and encouragement to say go get them. Go make it happen. Live that big life that you were meant to live. Joe McCall: Yeah, that’s good. And these books are really good to read. I’m looking at them right now on Amazon and I’ve read several on here. I’ve read almost all of them except the Commercial Real Estate Investing For Dummies, so that looks really good. I like dummies books. It makes me feel smart. Cool. Well thank you Peter. Again, I appreciate you being on the show. Peter Conti: Well Joe, I appreciate you having me on here and I know that you’ve put a lot of effort into the show and the other things that you do over the years and I just want to let you know that, that I appreciate that and I know a lot of the people listening to your podcast appreciate you as well. Joe McCall: Good. All right, thanks. We’ll see you guys later on the next episode. Go to RealEstateInvestingMastery.com. If you’ve missed the links that we gave out and you want to hear this again, get a transcript and all that good stuff. Again, RealEstateInvestingMastery.com. And Peter’s free book is PetersFreebook.com. We’ll see you guys later. Take care. Great sequel to the last podcast. Thank you for all the valuable content. I’m looking forward to getting the Peter’s free book. In the podcast episode, Peter talked about doing commercial deals on apartment units. Any reason a no money down master lease would not work on 6 unit townhome package? I came across this tired investor a few months ago who was interested in selling, at the time I didn’t know how to help him. After listening to Peter, I’m motivated to give him a call. Thanks again for the inspiration and information! Another great podcast Joe!! !